The New Jersey Institute for Food, Nutrition, and Health is impressive both in size as well as in its plans to help transform New Jersey into a national model for promoting healthier lifestyles for children and families. It’s no surprise that an architect would come to mind as I sat proudly marveling in the atrium of our magnificent new home. The modern, open-concept building is a beautiful addition to the Rutgers campus, designed with nearly 70,000 square feet of research and community space dedicated to making New Jersey a healthier and happier state. It’s also a heartening testament to the support we enjoy from organizations like the Robert Wood Johnson Foundation (RWJF), which calls on all of us to work together to build a Culture of Health, where getting healthy and staying healthy are guiding values. So of course we have to think big. The scale of our ambitions must match the scale of the problems we face. The event brought home the fact that at IFNH, we’ve made no little plans. In fact, we’ve made giant plans—plans suited to a building as grand and impressive, as integrated and connected, as the Institute. These plans are critical to helping address big problems that our communities are facing. We face formidable health challenges on campus, in New Jersey, and far beyond: food access, childhood obesity, digestive health, and many other pressing health challenges await our efforts. For too long, we’ve defined being healthy as simply not being sick—and it’s time to broaden that definition. For example, we’re striving to improve the health of children by deploying evidence-based educational programs about nutrition and exercise. We’re exploring how preemptive nutrition and lifestyle changes can alter the course of a person’s life while reducing the overall cost of care. We’re researching how the gut microbiome affects digestive disorders. And we’re exploring ways to use mobile technology to steer people toward healthy behaviors. The health of people here in New Jersey and around the country is often unduly and unequally influenced by geography and socioeconomic factors. At IFNH, we’re working to help everyone—whatever their ethnic, geographic, racial, or socioeconomic circumstance happens to be—live longer, healthier lives. We’re working to pioneer the translational research that will make New Jersey “the healthy state” and a model for communities well beyond its borders. Were Burnham alive today, he would, I imagine, salute the building as an elegant instance of big plans come to fruition. But he’d also recognize that a building is one thing, an institute another. The building doesn’t make the Institute; people do: the students, staff, and faculty devoted to fighting for the good health of individuals at Rutgers and beyond. Burnham’s aphorism is quoted often, but seldom in full. In its entirety it reads: “Make no little plans; they have no power to stir [the] blood.” Grand plans lift us up. They inspire us. And, I believe, they humble us as we work to carry them out. We dream big—not for ourselves, but because there are many individuals and communities who really need our dreams to become their reality. Thus it’s an honor to walk through the new building knowing the Institute houses the talent and energy of so many brilliant and committed individuals and enjoys the moral and material support of its supporters on campus, in the community, and at RWJF. Tour the new, state-of-the-art IFNH building and learn more about their work by visiting their website. 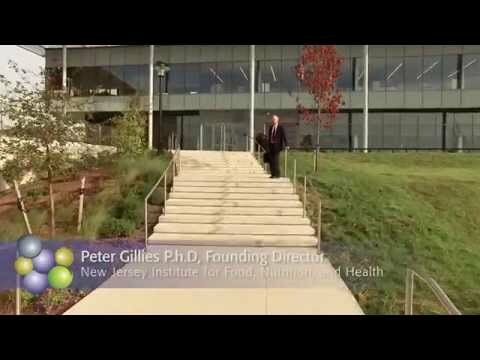 Peter Gillies, PhD is the Founding Director of the New Jersey Institute for Food, Nutrition and Health.